Went ice skating as part of my daughter’s birthday and it was an awesome experience. It had been years since I have been ice skating and it was good to get back out there. As I watched both the adults and children a few things came to mind that are just as applicable to life as they are on the ice. The first thing I noticed was that those in the group that let go of the wall first were the quickest to learn to skate. In fact, the two that didn’t even use the wall, were the best ice skaters in the group by the end of the two-hour session. One had not even been ice skating before. This got me thinking that in life when we remove our safety net we tend to grow the most. There is little to no growth in clinging to the safety net. The next key thing I learnt was that falling over was an important part of learning to ice skate. Those that fell over the most improved the most. Those that didn’t fall over at all didn’t improve. Their skill level on the ice remained the same. Again this is related to life. Anytime we step out in the unknown we learn and grow; however stepping out into the unknown also leads to mistakes and errors. So we should view these errors and mistakes as a good thing – all part of growth and development. Another key lesson was about encouragement. Everyone in the group encouraged each other to get out on the ice and to let go of the wall. The key to getting us all out on the ice was encouragement and the encouragement came from those already on the ice. Don’t we see this so often in life? Teams that encourage each other will achieve far more than those who don’t. 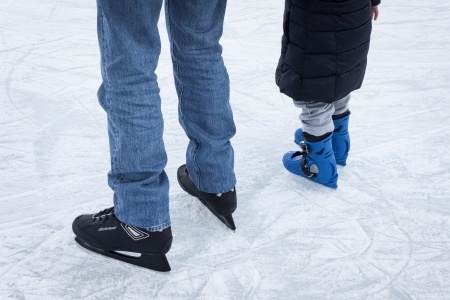 Occasionally on the ice two people collide – for any number of reasons. Though it may not be your fault, it is something you have to deal with. By observing what is happening around you, you can reduce the risk of someone hitting you. As in life, things can happen that are not planned on. To cut the likelihood we need to be situational aware and if things still happen then make sure we approach it with a good attitude. As the session went on the ice became to cut up. This did make it more difficult to skate on, however as most people stayed around the outside, it was worst on the edges. This meant that the middle had the best ice. So to let go and skate into the middle, where you are furthest from the safety net of the wall, was the best place to skate. In life successful people know that though it may seem risky and take effort to go after your dreams, it is very rewarding. By the end of the two hour session the best skaters in the group were doing tricks. These skaters also spend a fair amount of their time on their bottom. It seemed to go hand in hand. The better skaters fell over a lot as they pushed themselves to do better. In life this is so much the truth. Seems for one to be great at something we need to be able to risk setbacks and embarrassment. For you to be great at something; you need to be able to risk setbacks and embarrassment. Attila is a Cause & Effective Associate. He is passionate about life and thrives on helping people become better leaders. You can contact Attila here.